I absolutely love Thanksgiving...especially all the fabulous food! 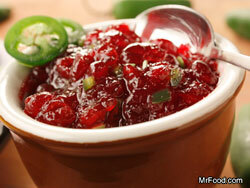 One of my favorite condiments is Spicy Cranberry Sauce. Add oil to a saucepan over medium heat and add jalapeno peppers. Cook diced peppers until they start to soften. This usually takes a few minutes. Then add your cranberries and cook for about five minutes. They will begin to burst. This is when you will add your ginger, orange juice, grated orange peel, water, sugar and vinegar. As the cranberries begin to cook start mashing the cranberries with the back of a spoon. Cook until thick which usually takes ten to fifteen minutes. You can serve it warm and cool. I like both! 1.Make the batter: Heat oven to 350 degrees F. Butter two 8-inch round cake pans and line an 8-cup muffin pan and set aside. Combine the flour, sugars, baking soda, baking powder, salt, cinnamon, nutmeg, and allspice in a large bowl. Toss the carrots, apricots, and nuts in the flour mixture and set aside. Whisk together the eggs, olive oil, milk, and vanilla in a medium bowl and add to the flour mixture. Stir until just combined. Transfer 3 cups of batter to each cake pan and 1/4 cup batter to each cupcake liner. 2.Bake the cakes until a toothpick inserted in center comes out clean -- about 40 minutes for cakes and 20 minutes for cupcakes. Cool cakes in the pans on a wire rack for 20 minutes. Release cakes from pans and cool completely on the rack. If freezing, skip to Step 2. Frost with your favorite icing. 3.To freeze: Double-wrap the cake layers in plastic wrap or place each one in a large resealable plastic bag, removing excess air. Place cupcakes in a plastic container with an airtight lid and freeze for up to 2 months. French Quarter Beignets - these puppies are incredible. My first encounter with this wonderful food was in Texas at a place called Crescent City located in Houston. I thought I had died and gone to food heaven. Here is a little history about the beignet. Beignets are the official doughnut of Louisanna (does California have an official doughnut???). Beignets are light, puffy pastries traditionally served in New Orleans. No visitor to the Crescent City can consider a trip complete without a stop at Café du Monde for beignets and café au lait. Like most Louisiana customs, beignets have an interesting history that began in France and traveled all the way to the mouth of the Mississippi. Food historian Cathy Kaufman wrote that beignets might have come to France from Spain. For centuries, Spanish cooks have served deep-fried yeasted fritters known as "bunuelos." During Islamic rule in the Middle Ages, customs from the Andalusia region of Spain probably spread to Mediterranean France. At this time, deep-fried balls of airy choux paste, or "pets de nonne," were also called Spanish beignets. Like most New Orleans traditions, beignets have been associated with Mardi Gras in France since the 16th century, and many recipes for beignets appear in French works around this time. Stradley writes that the Ursuline Nuns of France brought beignets to America when they settled in Louisiana in 1727. Café du Monde, however, attributes the Acadians, French settlers who were ousted from Canada by the British in 1755, with first bringing the pastry to Louisiana. According to the 1902 Picayune Creole Cook Book (published in New Orleans), French colonists brought the custom of serving sweet treats such as beignets from the old country to Louisiana. Needless to say, these wonderful treats are worth the trouble of making. Enjoy! I want to eat it NOW!!! Cream the butter and cream cheese with a mixer. Add the cocoa and vanilla. Add the confectioner’s sugar in small batches and blend on low until combined. Scrape down sides with each addition. Add 1 tablespoon of milk at a time until you get the consistency you desire. Position racks in the center and bottom third of the oven and preheat to 375°. Lightly butter four 8 1/2- to 9-inch cake pans (you will bake the cakes in three batches) and line the bottoms with rounds of parchment paper. Flour the pans and tap out the excess. To make the layers, sift together the sifted flour, baking powder and salt. Sift the mixture one more time, and set aside. Beat the butter and sugar in the bowl of a heavy-duty electric mixer fitted with the paddle blade on high speed until light in color and texture, about 3 minutes. Beat in the eggs, one at a time. Scrape down the bowl and be sure the mixture is well-blended. On low speed, add the flour in 3 additions, alternating with 2 additions of the milk, beginning and ending with the flour, and beat until smooth, scraping down the sides of the bowl often with a rubber spatula. Beat in the vanilla. Using a scant cup for each layer, spread the batter evenly in the pans. It will make a thin layer. Staggering the pans on the racks so they are at least 2 inches from each other and the sides of the oven and not directly over each other, bake the layers until they feel firm when pressed in the centers and are beginning to pull away from the sides of the pans, about 12 minutes. Cool in the pans for 5 minutes. 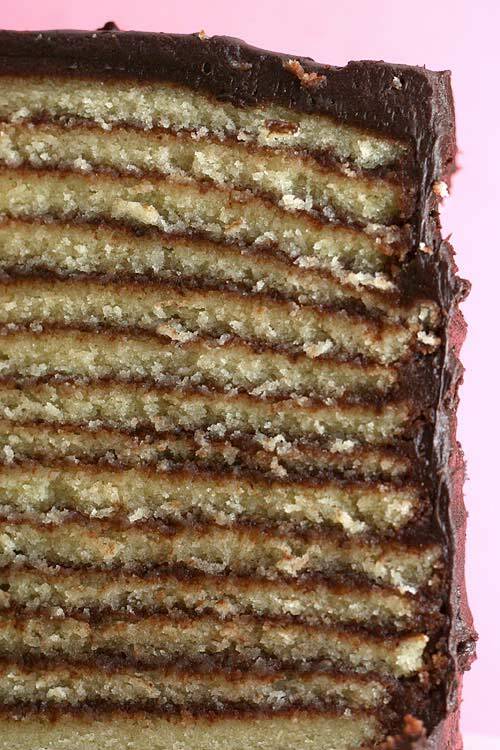 Invert the layers onto cake racks, remove the parchment paper, and cool completely. Wash and prepare the pans. Repeat the procedure until all 12 layers have been baked and cooled. To make the icing, bring the sugar, cocoa, butter and evaporated milk to a full boil in a large saucepan. Reduce the heat to medium-low and cook until the icing has thickened slightly (it will resemble chocolate syrup but will thicken as it cools), about 3 minutes. Stir in the vanilla. Let the icing cool until thick enough to spread, but still pourable. Recommended technique: If you buy inexpensive aluminum foil cake pans at the grocery store (they can be saved for another time as well), you will be able to knock out layers in no time. And no washing between baking!.. Combine first three ingredients in a heavy saucepan over low heat until brown sugar dissolves; stir occasionally. Divide equally between two greased 9" round cake pans (I sometimes use a 9x13 pan). Sprinkle evenly with pecans; let mixture cool slightly. Sift together flour, baking powder, spice, baking soda, and salt in a bowl; set aside. Blend sugar, oil, and eggs; alternately add pumpkin and reserved dry ingredients. Spoon batter evenly over pecan mixture in cake pans. Place pans on a baking sheet and bake at 350 degrees for 35 to 45 minutes or until centers test clean. Cool cakes in pans on a wire rack for 5 minutes; invert and cool completely on wire rack. Beat whipping cream until soft peaks form; stir in powdered sugar and vanilla. Continue beating until stiff peaks form. 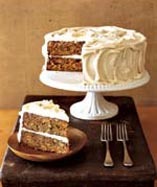 To assemble cake, place on layer on a serving plate, praline side up; spread with whipping topping. Add second layer, praline side up and top with remaining whipped topping. Garnish with pumpkin pie spice. This is best served warm. 1.Mix sugars, peanut butter, shortening, butter and egg in large bowl. Stir in remaining ingredients. Cover and refrigerate about 2 hours or until firm. 3.Shape dough into 1 1/4-inch balls. Place about 3 inches apart on ungreased cookie sheet. 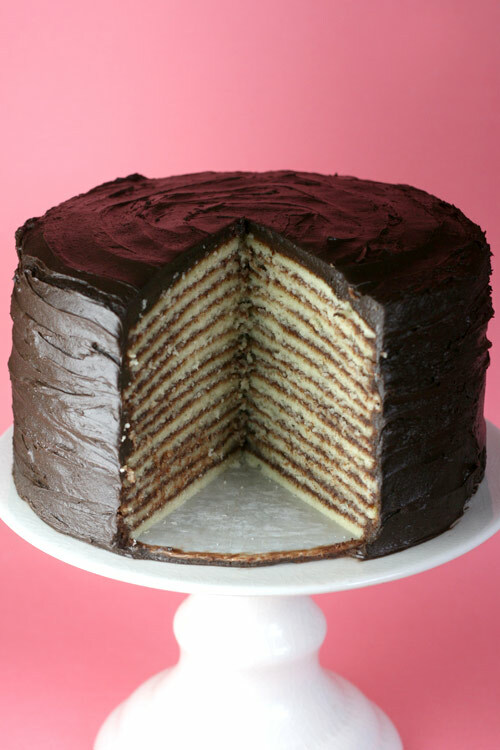 Flatten in crisscross pattern with fork dipped into sugar. 4.Bake 9 to 10 minutes or until light golden brown. Cool 5 minutes; remove from cookie sheet. Cool on wire rack. 1.Combine flour, baking soda and salt in small bowl. Beat butter, granulated sugar, brown sugar and vanilla extract in large mixer bowl until creamy. Add eggs, one at a time, beating well after each addition. Gradually beat in flour mixture. Stir in morsels and nuts. Drop by rounded tablespoon onto ungreased baking sheets. 2.Bake for 9 to 11 minutes or until golden brown. Cool on baking sheets for 2 minutes; remove to wire racks to cool completely. 1.Heat oven to 350°F. In large bowl, beat butter and sugars on medium speed of electric mixer until creamy. Add eggs and vanilla; beat well. Add combined flour, baking soda, cinnamon and salt; mix well. Add oats and raisins; mix well. 2.Drop dough by rounded tablespoonfuls onto ungreased cookie sheets. 3.Bake 8 to 10 minutes or until light golden brown. Cool 1 minute on cookie sheets; remove to wire rack. Cool completely. Store tightly covered. 2. Prepare pizza crust as directed. Add garlic powder into mix if desired. With floured fingers, evenly press and shape dough onto a nonstick cookie sheet or a pizza pan. 3. In a microwave safe bowl, combine olive oil, minced garlic and 1 teaspoon dried Italian seasoning and heat for 20 seconds. Drizzle olive oil mixture over the pizza crust. 4. Add the rest in the following order: mozzarella cheese, chopped chicken, chopped tomatoes, chopped spinach, parmesan cheese, the remaining 1 teaspoon dry seasonings. 5. Bake pizza 15 minutes, or until the crust is golden brown and the cheese is melted. 6. Drizzle the sauce (recipe below) over pizza. 1. In a saucepan, melt butter. Add flour and salt. Whisk and cook for 1 minute over medium heat. 2. Add milk all at once and continue cooking and stirring until thick. 3. Add ricotta cheese and parmesan cheese. Wisk until smooth. Add salt and pepper to taste. Remove from heat. "Today's Menu: Take it or leave it!"